3This essential classic title provides a comprehensive foundation in the C# programming language and the frameworks it lives in. 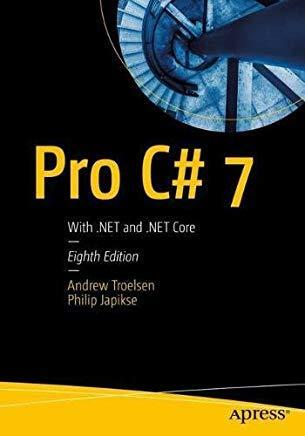 Now in its 8th edition, you'll find all the very latest C# 7.1 and .NET 4.7 features here, along with four brand new chapters on Microsoft's lightweight, cross-platform framework, .NET Core, up to and including .NET Core 2.0. Coverage of ASP.NET Core, Entity Framework (EF) Core, and more, sits alongside the latest updates to .NET, including Windows Presentation Foundation (WPF), Windows Communication Foundation (WCF), and ASP.NET MVC.